Google Drive. Keep everything. Share anything. In Google Drive, you can create new documents, spreadsheets and presentations instantly. Work together at the same time, on the same doc, and see changes as they appear. Work better with the products you use everyday. Say goodbye to bulky email attachments. Send a link from Google Drive in Gmail and everyone has the same file, same version—automatically. Your pictures in Google Drive are instantly available in Google+, so you’re never more than one click away from sharing with your circles. Google Drive helps you get to your files faster. Search for content by keyword and filter by file type, owner and more. Google Drive can even recognize objects in your images and text in scanned documents. Open over 30 file types right in your browser—including HD video, Adobe Illustrator and Photoshop—even if you don’t have the program installed on your computer. Google Drive with your favorite apps. 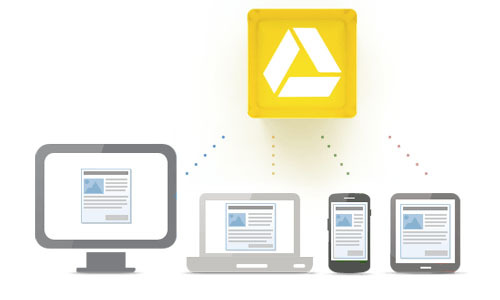 Create, open and share files from a variety of apps directly in Google Drive. Share the way you want. You can share files or folders with anyone, and choose whether they can view, edit or comment on your stuff. Create and reply to comments to get feedback and make files more collaborative. Google Drive tracks every change you make—so when you hit the save button, a new revision is saved. You can look back as far as 30 days automatically, or choose a revision to save forever.